Nest week I’ll be on a panel at American University along with the Maya Arad & Ruby Namdar. We’ll all be signing books after the discussion. If you’re in DC, come join us! I’m reading at Pete’s Candy store at part of the Rally Reading Series—hope to see you there! I'll be discussing the writer/editor relationship with my editor Emily Bell and rockstars Amelia Gray, Catherine Lacey, and Jac Jemc at this AWP panel in Tampa, FL. March is ToB month, and this year I'm one of the judges! Follow and participate in the fun all month! Yay books! Nelly Reifler and I will be guests on Stella Fiore's Cut + Paste on Staten Island's Maker Park Radio. We'll discuss the collaborative book of short stories we're writing. Tune in! I'll be teaching a 4-week online Creativity Unblocking Workshop for Catapult, starting 11/29. You can check it out and register here. I'll also be teaching my Backstory class for Catapult again starting November 1st--in person, at the Catapult offices in Manhattan. Registration for that has not yet opened, but stay tuned if you might want to join! I'll be reading at Ledig House (near Hudson in upstate NY) on 9/23--stop by if you're around! The reading features 9 writers from all over the world. The reading also features: wine. I'll be reading some fiction along with four other writers from Britain, France, and South Africa as part of the Chateau de Lavigny residency. Lavigny is less than 30 minutes from Geneva by train--if by any chance you're around, stop by! Wine and snacks will be served at the post-reading reception. The reading will be in part in English and in part if French. Alice Sola KIm and I will read from our novella, CLEAN, at the Sunday Salon. We'd love to see you there! 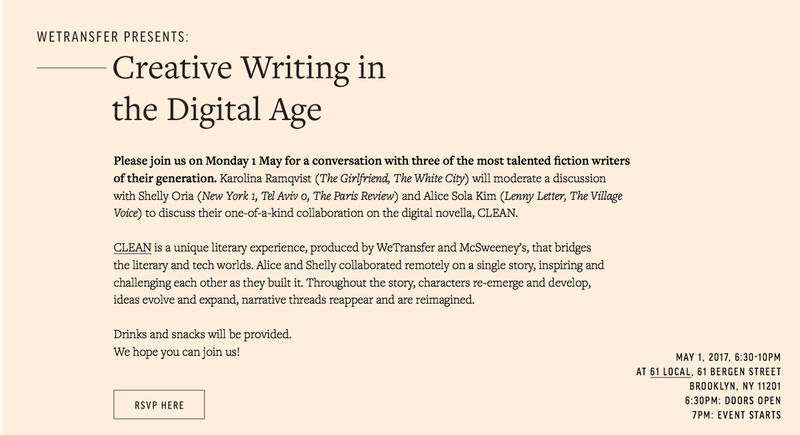 McSweeney's and WeTransfer will be throwing a release party for CLEAN, a novella I wrote with Alice Sola Kim. Save the date! Venue info TBD. Nelly Reifler and I will visit Pratt to discuss the book we're writing together. A Reading with Cocktails to Match! I'll be reading at YeahYouWrite along with Anna Solomon Jon Papernick. Come/listen/drink. I'll be reading at The Golden Notebook bookstore in Woodstock along with D. Foy and Tobias Carroll. Hosted by Nelly Reifler. I'll be participating in a number of events at the festival, including the Happy Ending reading, and a conversation with Zeruya Shalev. I'll be discussing writing and creativity unblocking at Hebrew University in Jerusalem. I'll be reading at the launch of Kate Angus's So Late to the Party, along with Alison Espach and others. Afterparty to follow, because we are people of tradition. I'll be reading at a NYFA event hosted by Said Sayrafiezadeh at McNally Jackson in Soho. I'll be reading as part of this installment of the How I Learned Series. Tickets are $6 in advance / $10 day of the show. Nelly Reifler and I co-wrote a story. It's called Ruben. It'll be featured in the new issue of No Tokens. We are now developing it into a linked story collection. Soon, you'll be able to read an interview with us about it on the No Tokens site. And even sooner, you can hear us read a short excerpt at the Center for Fiction for the launch party!. Come come come. I'll be reading at the inaugural Pen and Brush Presents Reading Series. Hope to see you there! I'll be reading at the Vica Miller Literary Salons with some wonderful people. Come! I'll be reading and doing a Q&A with the students in the MFA program in Creative Writing. I'll be reading here with some great people, and celebrating three years of this East Village series at the HiFi Bar, hosted by Amanda Miller. Free cupcakes, people! where the Israeli launch of New York 1, Tel Aviv 0 will be celebrated. I'll be reading from the book along with three actors--Ron Shahar, Michal Weinberg , and Roy Assaf. Complimentary wine and snacks will be served, courtesy of Keter Publishing. I'll be reading with Melissa Febos, Stacey D’Erasmo, R. Erica Doyle, Amy King, Lydia Conklin, Naomi Jackson, and Kirstin Valdez Quade at Housing Works in Soho as part of the annual Shameless series. I'll be reading with Lucy Ives, Nicole Haroutunian, and Lynne Tillman at Housing Works. The event will be moderated by Harper's Christine Smallwood. New York 1, Tel Aviv 0 has been nominated for a Lambda Literary Award. Come to the ceremony! You can buy tickets here. I'll be reading some work, along with other LMCC writers in residence, on Saturday 6-8pm. There will be 30 other studios to visit, if you'd like--other writers as well as visual and performing artists. You can find more info on all participating artists here. 315 Hudson St., 8th floor. New York, NY.